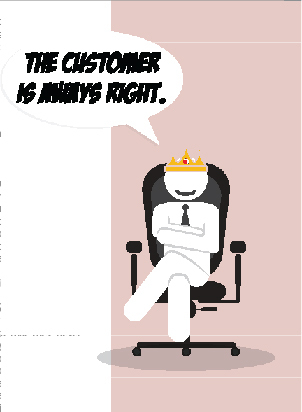 Customer experience has always been king, and we have always seen statements like ‘The Customer is always right’. What has changed, however, is the way people interact with companies, and what is included in customer experience. Things used to be much easier before the Internet, because all you had to care about was how the customer felt when they walked into your store and when they talked to you over the phone. Since our methods of interaction were limited, the interaction itself was also very limited. This couldn’t be farther from the truth nowadays, thanks to social media and the Internet. Now customers can be interacting with you any time and in any place, and one small mistake can end up being seen by thousands of people. In such an environment, you have to ensure that your customer service is exemplary. This isn’t just common sense; the effect of customer experience has long been researched and proven. According to a recent research report presented by Accenture, 72% of people who switched brands say they switched because of poor customer service. 30% of retail consumers said they switched brand after a single negative experience. The worst part is that 73% of people who had switched brands said they would never consider doing business with the previous brand again. 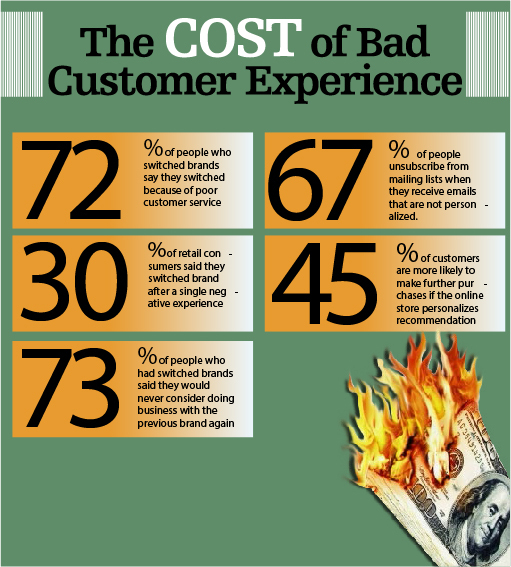 These numbers should tell you all you need to know about the unparalleled significance of customer experience. Data is the king of customer interaction. If you do not know your customers then you will not be able to customise the experience according to them, which results in a poor experience. We have seen companies that had email support, Twitter support, Facebook support, and phone support but they did not have their data integrated. This means that when a customer who had previously emailed their complaint called to talk about it, the customer service agent had no idea what the customer was talking about. This is very agitating for the customer and needs to be fixed immediately. When someone from your company talks to a customer they should have a file ready with all the interactions with the customers from every channel. This is basic stuff and can result in amazing customer service. Too many companies have invaluable data that they never utilise. Using your data properly can lead to customised marketing with more efficiency than ever before. Target is one of the companies that does it right. An example of this being the recent instance (featured in Forbes and other places) where the company Target managed to figure out a girl was pregnant before the father, through their personalised data system. How you ask? Simple, Target considers all the purchases of its customers and creates trends. The girl started buying things that are usually bought by women who are in the early stages of pregnancy, which put her in the list of customers that are pregnant. You do not need to do such detailed analysis if you aren’t a retailer, but even a little bit of analysis will teach you much more about your customers. People hate spam and anything that does not specifically target them can be considered spam. 67% of people unsubscribe from mailing lists when they receive emails that are not personalised. On the other hand 45% of customers are more likely to make further purchases if the online store personalises recommendation according to what they like. Big companies like Amazon execute this very well but smaller stores will need to do the same in order to compete and succeed. You will not be able to create a great experience for your customers unless you know what they experienced on the way to your store. You have to create a map that properly displays every channel they touched upon before they reached you.Are you customers coming to you from your social media channels? Then you need to ensure that everything you do on your social media channels is of the highest quality. You need to learn what websites they visit to gather information about products and what influences them. Once you have a map you can focus on improving every step of the journey. Make your website easier to read and browse, make information easily available on social media channels, and be more responsive when it comes to customer service on unorthodox channels. Also try to locate the main pain points, the parts of the journey causing the most dissatisfaction. You need to focus on customer experiences, not just service. The reality is that people are willing to pay more for better experiences; you do not have to race the competition to the bottom when it comes to costs, and you need to ensure that you are using all the weapons in your arsenal. Making the experience is not a complicated thing but what it will need is commitment. Having loyal customers is the best thing a company can possibly ask for; not only do they buy more than other people, they are also much more likely to recommend your product to another person. ople as well. You also need to ensure that you give your customers as much choice as possible. Do not force them to work in ways they do not want to. 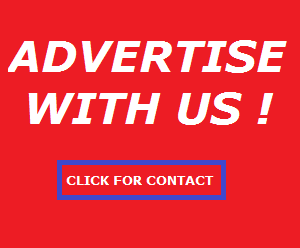 Do not force them to use the payment option or purchasing method that you want. Let people pay in different ways. One thing which consumers appreciate a lot is being allowed to select products online which they can pick-up in store. They know they can do research online easily but they still want to look at the item before buying it. The reality is that customers have more power now than they have ever had before, and you need to respect it. If you do not make the experience good for them, they will simply go to the next seller. They will also notify other people on their social media about the move. Use each and every thing you have to make the experience better. Essentially, customer service really boils down to the concept of communication and understanding. How can you give people what they want, if you have no idea what that actually is? Through the pillars of collecting and implementing data, properly utilising social media, personalising content and ultimately being compassionate and understanding of the customer’s desires, anyone can create a customer service experience that will be nothing but beneficial to business.